From yule logs to cool blogs, here are a selection of blogs to check out on your new smartphone throughout the 12 days of Christmas. A mixed postbag of climbing, hill walking, mountaineering and the great outdoors. One of the world’s most respected experts on long-distance walking and backpacking. Renowned writer, photographer and gear expert, Chris Townsend blogs about his walking adventures, having already chalked up more than 15,000 miles in the wild places of North America, Scandinavia and Scotland through a dozen huge solo walks. Chris is the BMC's first ever BMC hill walking ambassador. Pete Whittaker and Tom Randall aka Wideboyz bill their blog as the search for the widest, dirtiest and hardest offwidths that this planet has to offer. The journeys, the training, the routes and the failures - no holds barred. It's not about the grade, it's about the experience and when it comes to The Wide the experience is the same for everyone! Ranked third in the world in competition bouldering Shauna Coxsey gives insights into what it takes to be at the top of your game. Read about her current projects and reflection on the international competition circuit. Shauna is one of the new team of BMC ambassadors. Catch up on the travels and climbing escapades of a professional climber. 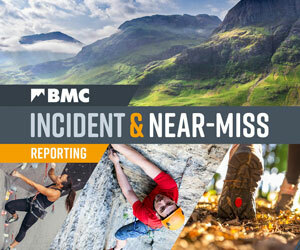 Read Hazel’s latest post rounding up her recent trip to the US of A. Hazel is a BMC ambassador. You want ice? You got ice! Read the latest from British mountaineer Nick Bullock, currently playing with ice in Canada. Follow Mina’s rock adventures from Stanage to South Africa. Read her flowing musings on what constitutes trying hard, insights on the CAC calendar and her approach to tackling those challenging routes and problems. Andrew Bisharat is among the few bloggers who takes the microscope to the world of high end sport climbing. Telling tales of little holds and big efforts, and of the characters and the motivations of the people who succeed and fail on the world’s hardest climbs. A nice change from the self-reflective blog, although there’s a bunch of naval gazing thrown in for good measure. Canadian climber, explorer and paraglider Will Gadd blogs about life on the seasonal roadshow. He's established some of the hardest mixed ice climbing lines in the world so expect lots on that theme at this time of year. Also insights into coaching, comp psyche and things like erm...DTS, figure fours, modded tools in comps and outside. Funnily enough the blog of outdoor writer and photographer David Lintern brings us writing and photography from remote mountain walks. With a conservation and photography background, topics range from risk in the outdoors to protecting wild land, as well as a gear diary. Andy's trek and backpacking blog includes regular gear and book reviews. Musings on tents and tarps and other stuff. Olympic dreamer ‘Winter’ Andy Turner climbs in dark and dirty little holes in the ground with shiny spikes and bright clothes. He climbs in dreadful conditions on howling Scottish crags in the depths of winter. He swans off to glamorous European destinations to test himself against Austrian machines, all powered by Redbull. Find out what he thinks of it all. High energy posting from one of climbing’s oldschoolmasters. However he’d rather climb 9a than rest on his laurels. He’d rather take shots at the bull than lay down with the lamb. Big words in big letters. A climbing journalist’s take on all things outdoor adventure. This is an online arts magazine for the great outdoors containing reviews, comment and news about all the books, films and art appearing around the world about wild places and the wild things that happen there. Generated by BMC vice president, author and journalist Ed Douglas. A literary compilation of British outdoor writing featuring some of the best of UK mountain, art and environmental articles. Provides both new articles and republished classics which have been cherry picked from climbing/outdoor magazines and club journals. Scotland's leading outdoor commentator Cameron's McNeish's new blog about 'boots and bikes' brings us tales of the Scottish mountains and dressing his bike up like a Christmas tree. Lakes-based author and Fix the Fells programme manager Tania Oliver gives her take on the natural wonders of the Lakes, including gear reviews to help you enjoy the hills in comfort. Get your Lake District photo fix here. A client's-eye view of the world of mountaineering and adventure travel. Mark's posts explore Everest stories past and present and other great summits around the world. Dave gives regular insight into his latest projects and is a great blog to read to absorb tips to improve your climbing. Currently blogging about his return to climbing from surgery. US climber Chris Kalous's hugely popular and humourous podcast recorded in a mobile studio is one of the best around. Each episode of the Enormocast brings you a glimpse into the climbing life through discussion, interviews, and Chris’s perspective backed by his 20 years in the sport. Mostly focused on US climbing but wait... what's this?...check out the new podcast interview with British hotshot Hazel Findlay.